Hi everybody! Do you have a term for this kind of fruit juice container? 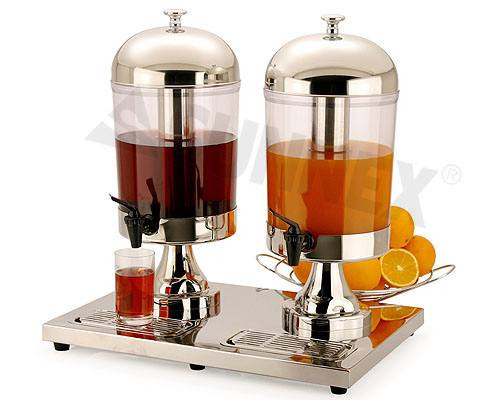 It would go under the general term of dispenser, drink dispenser, fruit juice dispenser. If it is refrigerated it could be called a chiller. tony h and Bob : Thank you both very much for your help. I really apppreciate it. Would I be completely wrong to call this thing an urn? A samovar? Does a samovar HAVE to contain only hot tea? To me, "dispenser" applies to other stuff: cup dispenser, tic-tac dispenser, pez dispenser, soap dispenser. Not beverages in large amounts, but I suppose you could say it was a beverage dispenser. (Actually, I looked it up on the google, and these things seem to be marketed as "Beverage Dispensers".) I wouldn't argue too much about it. Same with chiller, but I might say "Beverage Cooler".